I have been using Rimmel London Renew and Lift powder for years and I don't know if this is the tenth or eleventh compact that I have bought so far.It's just amazingly light and doesn't feel heavy and cakey at all.I buy the color 103 True Ivory. 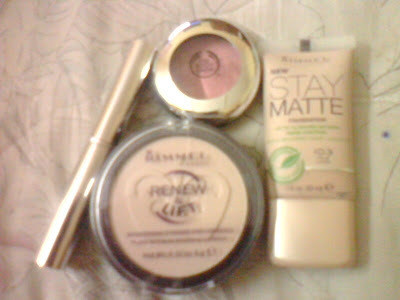 Recently I thought that I'll try their newest foundation which is Stay Matte because when I tried the tester,it was okay.And I choose the same color as my compact,103.Unfortunately,the foundation is too watery as it spills everytime I unscrew it and it doesn't give me up to 12 hours of natural shine control like it said it would. I still have to use my pink grapefruit Clean & Clear control film.Once this foundation is finish,I'd stick to Silky Girl BB Cream in Radiant,which is far better. For concealer,I have been wearing The Body Shop's for years.Usually I wear the stick/pencil kind but nowadays I've switched to that silver tubed thing.I don't remember it's name but I think it's brightening-something.ahaha.The pic is above. For blusher,it's from The Body Shop as well and I love the fact that the color is pretty natural and peachy with a bit of gold specks in it.Lovely! Eyes are the windows of the soul.Thus even on my busiest days and I've no time to put on any eyeliner,I make sure that I atleast curl my lashes.My favorite mascara,along with millions of other women in the world has got to be Maybelline. 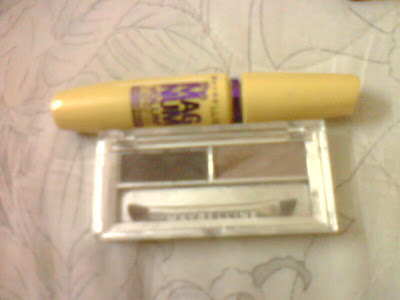 I've tried various mascaras from them since I was a teen!But my favorite one has got to be the one in the baby blue tube which I've forgotten the name for it.Nowadays I'm wearing Magnum Volume Express in Black which does not dissapoint!It does not clumps and gives you amazing looking lashes! For eyeliner,I use Maybelline Lasting Drama Gel Eyeliner in Black or Brown.This gel eyeliner is AMAZING!It does not smudge and stays put for up to 12 hours or more!It's so smooth and easy to apply and I one gel eyeliner pot can last up to 7-8 months! 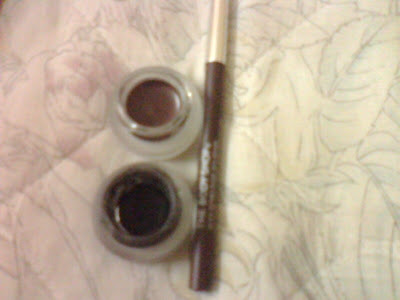 I also use a pencil liner from Body Shop in 02 Rich Brown. I rarely use eyeshadow but if I do,Elianto has a variety of fun colors to choose from! For my eyebrows,I use Maybelline Browdefinist in 01 Dark brown,which does a wonderful job because I find that eyebrow pencil does not look natural at all.Browdefinist consist of both wax and a brow powder. I don't like the feel of gloss or lipstick on my lips.I only wear them when I really have to or for special occasion. Thus I tend to use lipstain.Plus gloss sticks on the people that you kiss(ahaha) and glues your hair to your lips--blearghhh. 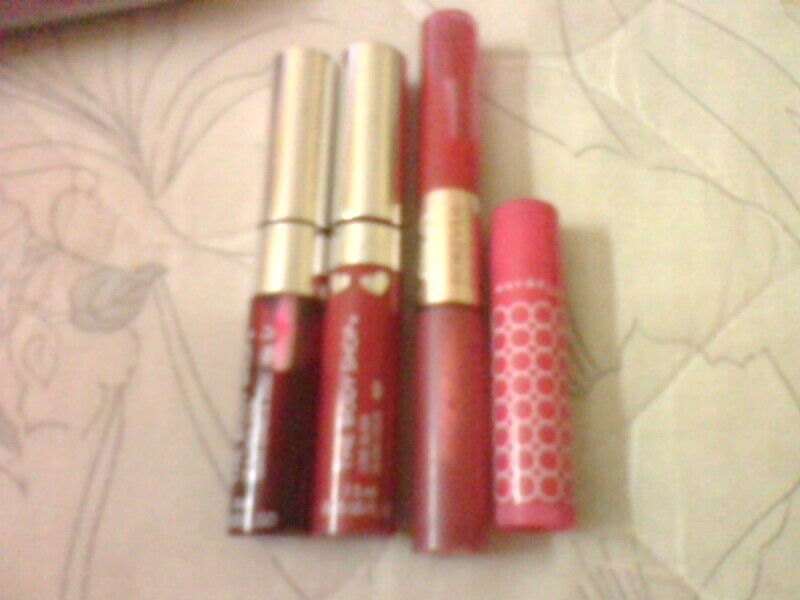 My favorite lip stain are from The Body Shop and Elianto(Forever Duo Lip,number 1).I would like to try Benetint though but haven't got the chance to go & buy it..yet.hehe. For lip balm,I use Maybelline in Cranberry Jam and actually this is the colour that I wear everyday. For gloss,I wear The Body Shop Love Gloss in number 11. So people,that's all the makeup that I usually wear. :)Hope that it helps! Oh boy, I use mascara and lipstick and that's it! Next time someone gives me makeup, I know where to send it! sorry i accidentally cc u in tat email-- i think i even 4get to send it to lydia!have done it though..phewww..thank u!